There are a lot of workout plans out there. And I mean a lot. You cannot go a day without seeing a new workout plan pop up in an ad on your favorite websites. They are everywhere. And that’s ok. I have done a number of workout plans over the years and have seen positive results from them. From time to time I get asked what is the best workout plan. Instead of me having to explain every nuance of each workout I decided to put together comparison charts and rankings for what I feel is the best workout. I will only write about workout plans I have completed or mostly completed. There are going to be a couple of workouts that I did not complete because they were boring, not good, over-hyped, or did not meet expectations. And I feel you should know that. Most of the workouts I have completed were done at home because that’s where I workout. You can probably do most of these workouts at the gym if you were to take workout sheets with you. I bought all of the workouts below with my own money. Many were in DVD format. As I complete more workout programs I will update them here. To make this list the workout plan has to have more workouts that leave your body shaking when your done and sore for days after. 1. Body Beast Every workout is designed to build muscle. Not feeling the pump? Lift more weight. It’s impossible to not build muscle with Body Beast. 2. P90X Push ups, pull ups, push ups, and more pull ups. The Monday, Wednesday, and Friday workouts will challenge your muscles for all 90 days. Follow the P90X schedule correctly and you will build muscle all over. 3. Insanity Squat, push up, squat, and more push ups. Insanity is a cardio workout but with all of the body weight resistance workouts you will build muscle. 4. Insanity Asylum Vol. 1 Every workout is designed to build muscle. Push ups and squats in an agility ladder will build muscle everywhere. Add in the jump rope to build leg muscles too. 5. Primal Blueprint The simplicity of doing push ups, pull ups, squats, and planks will build those important “human muscles.” Do these for the rest of your life and see how much muscle you gain. 6. Herschel Walker Workout Very similar to the Primal Blueprint in that you do push ups, pull ups, and squats. The difference is you do hundreds if not thousands of them a day. Its impossible to not build muscle if you workout like Herschel. To make the list the workout plan has to have enough workouts that get my heart rate elevated, get sweat flying everywhere, and basically make me feel like I just detoxed. 1. Insanity Sweat will be flying everywhere. Little to no breaks for 45 minutes. Your heart will be pumping blood like crazy trying to keep up with Shaun T. The amount of sweat that comes out of my body doing Insanity is gross. 2. Insanity Asylum Vol. 1 Jumping rope in almost every workout. Moving push ups through an agility ladder. I sweat like no other when I do just about every Asylum workout. 3. Insanity Max:30 The goal of Insanity Max:30 is to do the moves for as long as you can. In doing so it gets my heart pumping and sweat flying. Cardio strength is the goal of Insanity Max:30. 4. Focus T25 T25 just barely makes the list because you are moving the entire 25 minutes. The moves get harder and the pace moves faster going into month two. I was debating about making a comparison table for best fat loss workout and best workout routines for men and women but those are mis-leading. You will lose fat doing any workout if you follow the plan and even more fat if you follow its meal plan. All of the workouts listed are good for men and women. There is no better workout for men or women. There are only workouts that hit your goals and get the results you want. And usually what matters is where your fitness is. 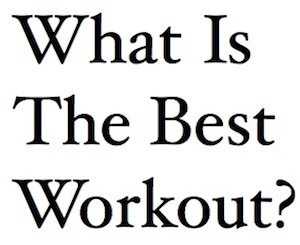 You probably have figured out by now that many of the workouts listed are Beachbody workouts. I didn’t start doing workout programs until P90X came along and would do the next one Beachbody released. My involvement in the Beachbody Coach program kept me in tuned to new releases but it does not mean I like every Beachbody program.